It's that time of year. The time right before exam season where you go out one last weekend before buckling down to study and put on your ugliest christmas sweater. 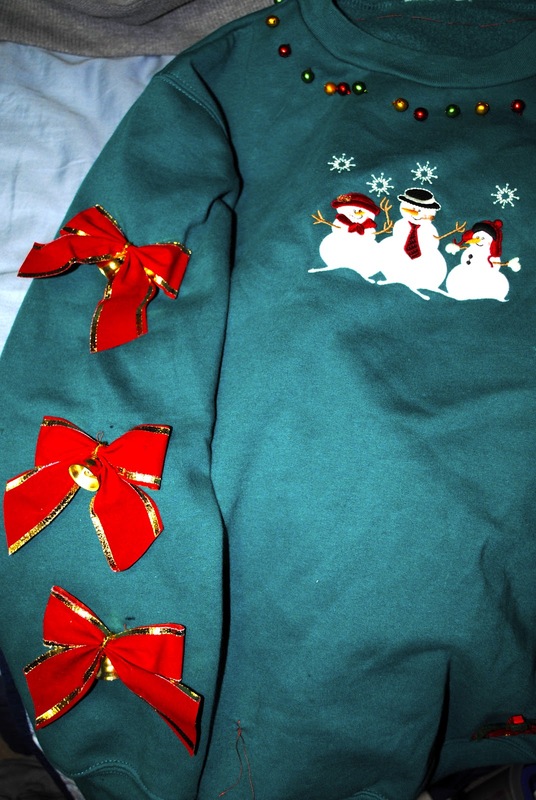 Now, I picked up this cute snowman sweater from Value Village, but decided it was more cute than ugly. So my roommates and I decided to take it upon ourselves to "ugly them up." And what better way than to spend some time at the dollar store on the tackiest christmas bows and loudest jingle bells we could find. We sat around drinking hot chocolate and watching elf while we worked like little elves ourselves, sewing on our tacky decorations to our sweaters. I added a jingle bell collar on mine, some bows (also with bells) down the sleeves and some poinsettias along the bottom, that didn't make it through the night. Definitely an improvement if I do say so myself and we all looked like christmas threw up on us. Success.